Tucked in a corner of a stone building off Avenue, you may miss the steps down to Brownes Bistro. Leading to a rather large restaurant, their décor is classic: the dining room consisting of dark wood and cream linens. If you’re a fan of old school restaurants like me, you’re in for a treat. Their Summerlicious menu ($28) was equally traditional, with the exception of the vegetable samosa, suitably safe for non-adventurous eaters. Of course, as a food lover, I love trying new things. But, sometimes I get tired of the shared fusion plates, doused in a variety of sauces and start yearning for timeless dishes. 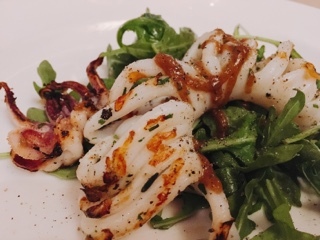 If Browne’s grilled calamari weren’t so salty, the starter would have been good: the seafood was tender with a gentle smokiness. However, this was ruined by over seasoning the calamari when the aged balsamic and shallot sauce drizzled on top was also so flavourful. 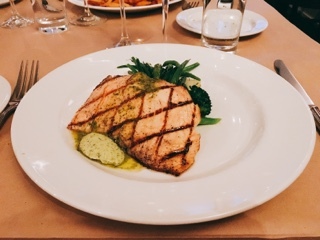 Despite being thinly sliced, the Atlantic salmon was surprisingly moist having been grilled quickly so it was just cooked through. 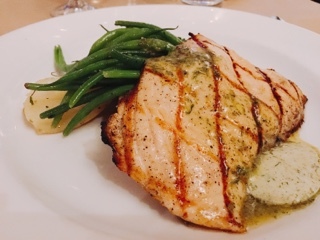 Unlike the starter, the fish was simply topped with a citrus-herb-lime infused butter and seasoned suitably. 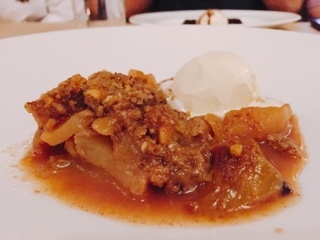 Although the presentation of the apple rhubarb crisp could be improved, the dessert was satisfying – plenty of apples and rhubarb baked until soft but still having bite. Not overly sweet, the dish relied on the buttery crumble topping and French vanilla ice cream to make it a dessert. Summerlicious gets a bad reputation amongst those working in the industry – I understand, they’re often serving a lot more food to a lot more people than they’re normally used to. With the special pricing, bill totals will ring in less so their gratuities are otherwise lower. Encounter dinner guests that are especially demanding (please don’t ask for substitutions) and I can see why it’s a draining two weeks. Yet, it’s also the perfect opportunity for restaurants to expand their clientele. If it weren’t for Summerlicious, I would have never tried Brownes Bistro, having found it by looking for dinner menus with a specific price point that’s close to home. Luckily, Theo, our server for the evening, didn’t mind the event. He welcomed us warmly, offered to take pictures, and joked with us throughout the evening … even though we were rowdier than their normal clientele (residents of the areas). Foodies, I challenge you to look past what’s flashy and new. Sometimes you need to step back and reconnect with the classics. After all, it’s not that often a business survives, let alone lasts over 30 years, there must be a reason.